Born in Cordoba in 1955, Rafael de La-Hoz graduated in architecture from the Higher Technical College of Architecture of Madrid, and went on to obtain an MDI Masters in the Polytechnic University of Madrid. Rafael de La-Hoz now directs his own architectural studio (Rafael de La-Hoz Arquitectos) and participates in town planning projects and important architectural works in Spain, Portugal, Poland, Romania, Hungary, and the United Arab Emirates. Many projects by Rafael de La-Hoz Arquitectos have been the results of national or international architectural competitions. Most recent awards by Rafael de La-Hoz Arquitectos include: the COAM (Distinction from the Official Architects’ Association of Madrid) 2007 and 2005 Distinctions for Architectural Works; The “2007 International Work Award” for Telefonica’s Distrito C, awarded at the XIst Biannual of Argentinean Architecture (Buenos Aires); The Award for Innovation in the “Quality, Architecture and Housing Awards” 2005 and 2006 of the Community of Madrid; the “Bex Awards 2005” (Greece) in the Technological Innovation” category and the “American Architecture Awards 2004 of the Chicago Antheneum (USA)”. Rafael de La-Hoz is a visiting professor at the Universidad Camilo Jose Cela, and is a member of the Editorial Council of the COAM Architectural Magazine. Rafael de La-Hoz participates in numerous conferences, activities and judging panels, and his work is published in national and international architectural books and magazines. – New building for the Criminal Courts, in the Justice Complex of Madrid (2008-11). – Isla de Chamartín Tower in the north of Madrid (2007-10). – Hotel and residential complex in the former Jewish ghetto of Warsaw, Poland (2007-11). – “Angel Corella” Dance School and Company in la Granja de San Ildefonso, Segovia (2007-11). 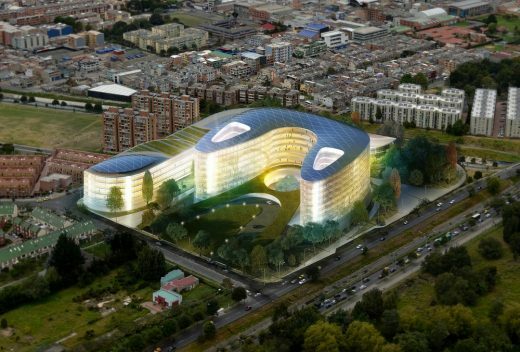 First Prize in Architectural Competition, jointly won with architect Jaime Duró. – Remodeling and extension of Marina Port Sherry. Puerto de Santa María.Cádiz. – Residential-vacation complex Águilas (Murcia), San Roque (Cádiz) and Bernia Golf, Altea (Alicante) (2007-10). – “Alegra” Office and entertainment center(2007-09). – Headquarters of AMA, Madrid (2007-10). – Numerous residential buildings in: Majadahonda (Madrid); Torneo (Huelva); Pirotecnia II (Seville) and Cortijo del Cura in Córdoba (2007-09). – Residence “Wronia 45” in Warsaw, Poland (2007-09). – Residential and hotel complex in Dubai (2007-09). First Prize in Architectural Competition. The Castelar Building, the Imserso Headquarters, The Spanish Olympic Committee, the extension of the Marine Ministry, the Alcala II Penitentiary, Aquinas Dormitory, the Castellana 110 Building, and the National Center of Supervision of Telefonica (Aravaca) in Madrid. In Andalusia, the Chamber of Commerce, the “El Aguila” Factory, the Caja Provincial de Ahorros, the Maimon Castle, the Canals Chalet, the Caja Provincial de Ahorros and the General Hospital in Cordoba. And in Malaga, the Palacio de Congresos de Costa del Sol, among others. July 5, 2017 in Architects.